If you thought that you finally had conquered schema.org, then you should think again since the partial merger combination with “GoodRelations” scheme will give you a whole new set of options. 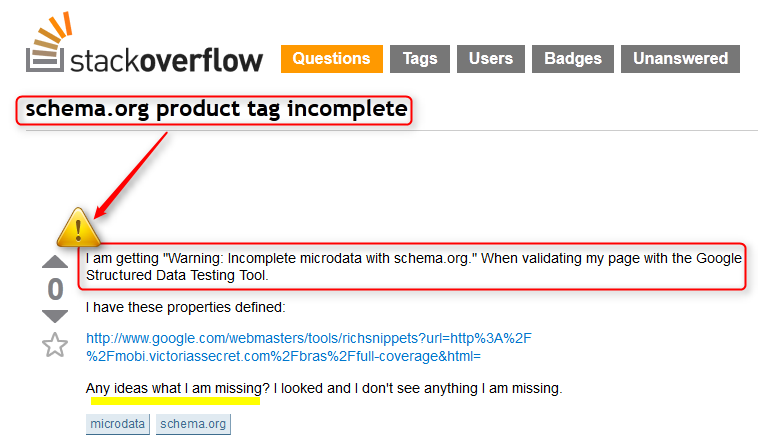 Even for those of you who already have implemented the new format the following section should be quite interesting since the phrase “Warning: incomplete microdata with schema.org” is being displayed in Google’s RichSnippets testing tool these days. Is my schema.org code broken? However, that kind of code now will give you an error message in the RichSnippets Testing Tool. And if you take a look at the RichSnippets testing tool, a whole new world will open: new data-types, already being used by Google! Schema.org was already great, but this promises even to be better: structured data will help search engines to display information better, faster and more accurate since they can give the found data more relevance. Also different kinds of devices (from your iPod Mini to your IBM Workstation) will have serialized data to display and especially for the E-commerce universe this will help to stay more competitive and targeted on products. Also really great is the features like limited availability in time and/or quantity, this certainly will be a complete new tool which can help to allure visitors by “baiting” them to visit your site. This entry was posted in RichSnippets and tagged display richsnippets, GoodRelations, Incomplete microdata with schema.org, Product Availablity, Product Price, RichSnippets, schema.org, schema.org/Product, Semantic SEO. Bookmark the permalink. Post a comment or leave a trackback: Trackback URL. I’m having the same problem with my price info and reviews not showing up in Google. But when I check your testfile, there isn’t anything showing up either. At least not in the snippet section. Using this means Travel Agent is not the brand but the organization is. And we have to re-write Brand/Organization, name twice or more if we were to enter details for the organization too. I have tried to find example for the schema.org/Brand and itemprop=”brand” but it seems there are not any examples or types used on this. Google’s rich snippet testing tool is showing brand only on second example. Not the first. Google testing tool is saying that itemprop=”priceSpecification” is not recognized by them. Thank you for this information. I have been searching for days how to make my website function and validate schema. You are kind to share your results.